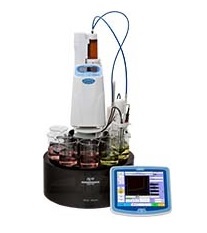 Allow to make continuous measurements on multiple samples easily by titrator unit. Compatible with various samples by combining shower rinsing or soak rinsing. Allow to setup a user-sequence for rinsing samples according to their properties. Allow for pre-treatment (dosing solvent) and post-treatment (draining waste liquid after measurement). Feature pre-treatment to allow reagent to be previously dosed. Optional water circulator allows to make measurements at low or constant temperature. The CHA-600 features 2 built-in persistaltic pumps. 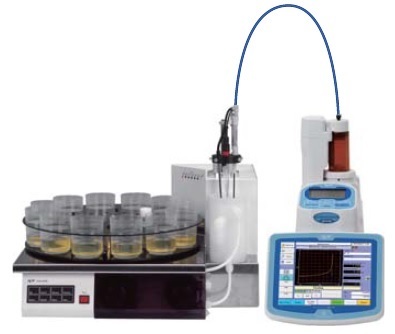 For special applications like non aqueous titrations or applications which require a pre-treatement of the samples or the addition auxiliary reagents the CHA-600 can control several additional external diaphragm and/or peristaltic pumps and an automatic piston burette. The additional pumps can as well be used to automatically empty the beakers after titration and to collect the organic and inorganic waste in different containers. They enable the CHA-600 at the same time to perform series of aqueous and non-aqueous titrations in a row, applying different rinsing and pre-conditioning steps according to the nature of the samples to be titrated. Volatile samples sometimes require cooling, others require heating either because they are solid at room temperature or in order to speed up chemical reactions. 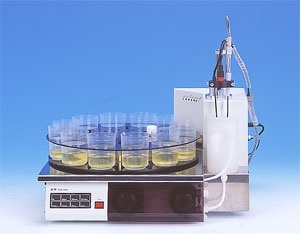 The CHA-600 can do both, as it can be equipped with a water bath connected to a circulating thermostat in order to heat or cool the samples as soon as they are put into the turntable. Pure water, Alcohol, Acetic acid, etc. 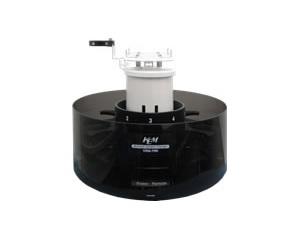 6 or 11 samples can be loaded for continuous measurement with connection of AT-710M, AT-710S, AT-710B & AT-700 Automatic Potentiometric titrator. Compact: size of combination with AT-710 and AT-700 is only 36.5 cm width. Sample rack up-down motion, rotation of arm. It can control an external pump to allows a powerful shower/drain for perfect cleaning the electrode and the stirrer after titrations.